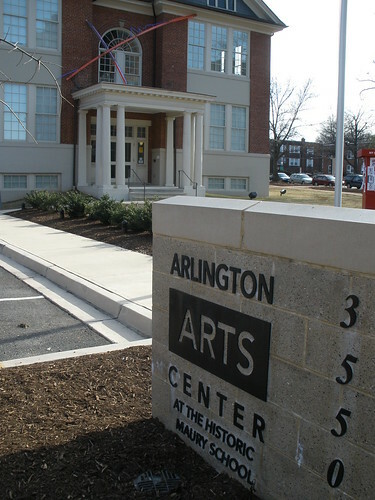 The Arlington Arts Center (AAC) is a private, nonprofit contemporary visual arts center dedicated to presenting and supporting new work by regional artists in the mid-Atlantic States. AAC is located in the Virginia Square area of the Clarendon and Wilson Blvd strip between Clarendon and Ballston. Right now, AAC is home to a few different exhibitions, but the one that got me out of the house last Saturday is the Public/Private exhibit I had been hearing so much buzz about. The exhibit I most wanted to see was an exhibit titled “Street With A View” about a staged Google maps street view street performance. The artists got together and created interesting things during the time when the street view car would be driving down the street in Pittsburgh. I was fascinated to see all the different things they staged for the car. 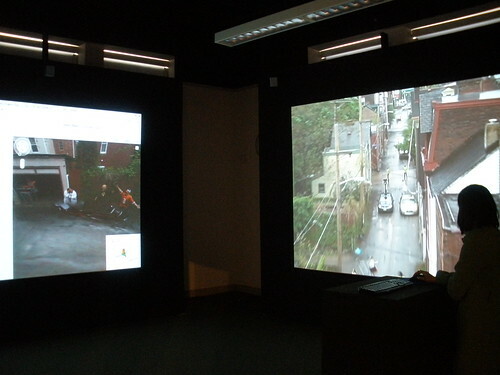 You enter a dark room with a keyboard, mouse and a projector screen, and a screen with a video loop of the staged parade and other activities, following the Google car. It’s fun to see all the things they set up – a marching band, a faux marathon, confetti, a mad scientist lab… All kinds of funny things everywhere you turn your mouse. I think of Google street view as such a foray into unchartered territory with regards to the public’s privacy – you can capture all kinds of easter eggs, and I love that the artists decided to play with reality and create such chaos for the cameras. 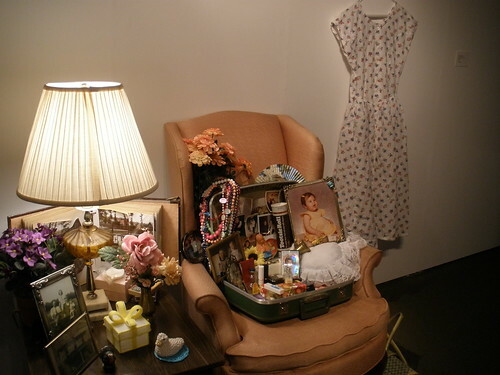 The next component was a set-up of different people’s private things, sort of an altar made out of your possessions. You can see who these people were through their things – shoes, food items, trinkets, photos, jewelry. Voyeuristic in a way, you can assume someone’s family, heritage, even career from these carefully chosen items. 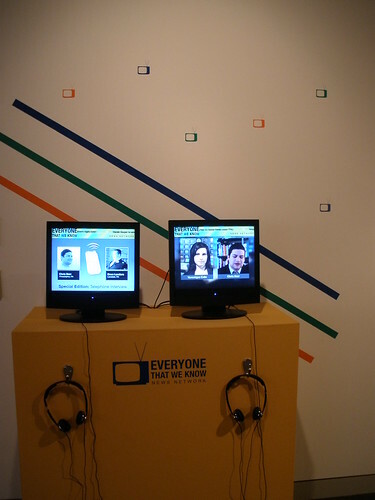 The next exhibit that I found intriguing was “Everyone That We Know” a faux-news show where you can hear “news anchors” reporting on their friends based on information from emails they’ve recently received discussing all their personal life, with a constant text stream of Twitter and Facebook status updates, like CNN would run the Dow and other news snippets. The Web site for the news network says “The Everyone That We Know News Network is a video performance executed from Veronique Cote and Chris Barr’s residence in Philadelphia, Pa. It is a home news broadcast featuring daily reports and updates on the life of family, friends, neighbors and colleagues. The project is inspired by the feminist slogan “The Personal is Political” popularized in the late 60s through an article by Carol Hanisch.” A clever commentary on social networking and how we, as generations and a society, think of as news, and what we consider news to be. Also on the lower level was an exhibit SKIN: America in Black and White, which most notably had 44 pictures of different skin colors shaking hands for our 44th president, and a color gradation of people’s skin colors, like a paint strip from home depot would look like. It was thoughtful and articulate. Arlington Arts Center is located at 3550 Wilson Blvd, in Arlington. The ACC is located right across the street from the Virginia Square/GMU Metro stop. ACC is open to the public Tuesday through Saturday from 11 a.m. to 5 p.m. 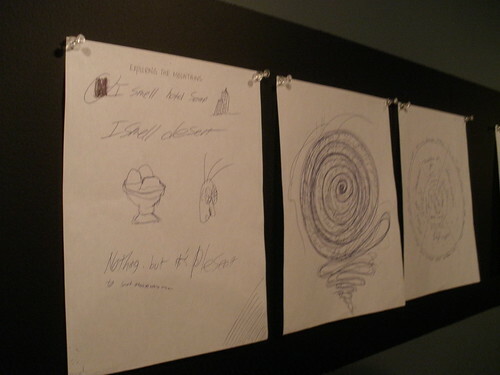 Photos courtesy of flickr user Needlessspaces.